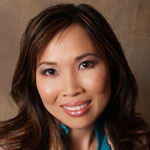 Dr. Vo earned her Bachelor of Science from the University of California-Irvine and her Doctor of Dental Medicine (DMD) in 2003 from the Temple University School of Dentistry in Philadelphia, Pennsylvania. She is an active member of the American Dental Association, Georgia Dental Association, Northwest District Dental Society, American Academy of Implant Dentistry, and a graduate of the Mercer Mastery Program. 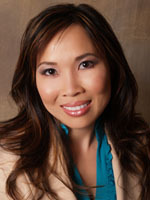 Dr. Vo has also received certification with the American Academy of Facial Esthetics. Dr. Vo is a member of two local dental study clubs, attended a one-year dental implant continuum at NYU and is successfully working on her associate fellowship status with the American Academy of Implant Dentistry. "Dr. Vo and her team are very professional and make you feel right at home! Highly recommended!" 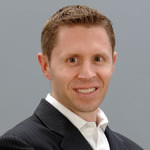 "Great staff... Dr. Lan Vo does excellent work and most of all...painless. Didn't have to wait for her to do the work...she and her staff got me right in at my appointment time without any delays...wonderful dentist ! Thanks again"
"I love this office! There is zero wait time. The front desk, clinical staff and physician are all so friendly and professional. Dr. Vo is so awesome. She is so accommodating. I found out I had to have a filling when I came in for my routine cleaning and she graciously added me to her schedule so I don't have to come back twice. The office is always clean and neat. I have been recommending this office to my friends and family." "I love coming here. 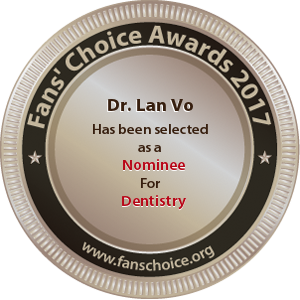 Dr. Vo is a wonderful dentist who cares about her patients. She made sure I was completely comfortable before any procedure I have had done there. I don't dread going to the dentist at all. The whole staff is just wonderful!." "I've never waited more than two minutes upon arrival. The service is excellent and the people are awesome! They have a beautiful and clean space that feels more like a high end spa or a yoga studio than it does a dental office. I even ran into Dr. Vo at Starbucks and she was kind enough to buy me a cup of coffee! Just very nice people that are very good at their jobs. Highly recommend!" "We travel fifty miles to see Dr. Vo. She is worth it. She is particularly good if you are afraid of dentists. Her rates are also lower than her old office rates. Her shots are painless and she does great work."